The area you fly over, your host’s hospitality, the quality of balloons and equipment, the expertise of your pilot, the post-flight celebrations, fun and involvement, all contribute to a real ballooning experience. You will launch at dawn, and drift with the wind – it’s just you and the elements. The flight duration is generally one hour. It can be anywhere from about 50 minutes to 1 hour 30 minutes, depending on the wind direction and the accessibility of a suitable landing site. 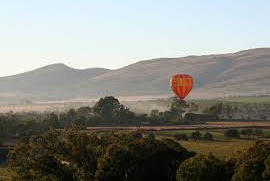 A most spectacular flight, given favourable wind direction, you will fly over the Vaal River and the Vredefort Dome. It is the site of the largest meteor impact on the planet. Minimum pax of 4 per flight.